These are so moist and fresh - perfect for spring. I made The Best Frosting Ever using a teaspoon of lemon extract - fabulous! But I have to say, I think these would also be fantastic with a glaze of lemon juice, powdered sugar, and lemon zest. When I make these again, I'll try that and post a recipe for the glaze. 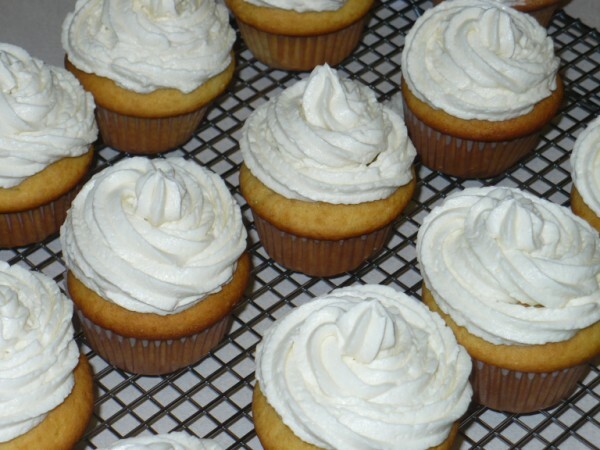 I followed the baking time on the recipe exactly and my cupcakes were too brown, so I have adjusted the baking time. This makes about 15-18 cupcakes, depending on how much you fill the cups. If you decide to double the recipe, you will only need 3 eggs, not 4. In a mixing bowl, cream butter and sugar. Beat in eggs. Add lemon peel and vanilla. In a medium bowl, combine dry ingredients. Add this to butter mixture alternately with sour cream. (Batter will be thick). Add food coloring, if desired. Fill paper-lined muffin cups about 2/3 full. Bake at 350 for 20-25 minutes or until toothpick inserted in center comes out clean. Cool for 10 minutes, then remove to wire rack. Cool completely before frosting.